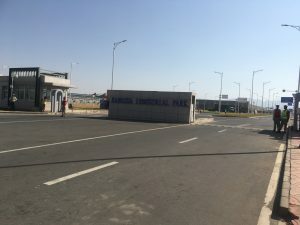 Industrial parks have become some kind of theme throughout the 2-week study trip to Ethiopia in our small but diverse and humorous group of 10 University of Bradford students. 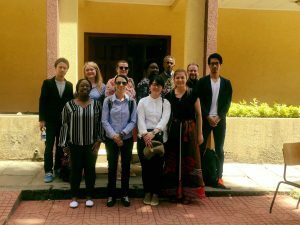 It all began one night in the first week of the trip with a Japanese fellow student carefully voicing his reservations about the planned trip to the Hawassa Industrial Park that weekend. This reservation aligned with our African politics professor, who hasn’t been shy about his utter disinterest in visiting industrial parks. Yet, it was the same professor who asked him why he didn’t want to go. The answer would not be forgotten for the rest of the trip – my fellow student had imagined an industrial park to be a park, with trees and plants and with old historic industrial engines exhibited, “Just like that one I visited in York.” After everybody had a good laugh, we clarified the meaning of an industrial park and agreed that we’d all be interested in going. So, two days later we went, and the pre-industrial park horseplay came to a sudden halt. 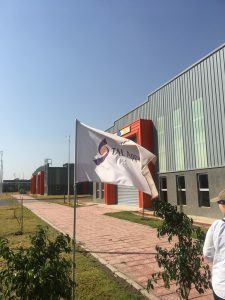 The industrial park, supposedly the biggest on the African continent, currently houses about 14 international, mainly Asian, garment companies and gives jobs to about 12,500 Ethiopians, largely women. The huge area could be located anywhere, the roads are flawless and a number of road sweepers ensure that it stays that way. The 52 hangars sparkle in the Ethiopian sun and a water recycling management system makes all the environmentally considerate Western aid workers happy. After a short introduction by the park manager, we visit TAL Apparel, a garment manufacturer from Hong Kong who recently opened this plant in Ethiopia. A local resident with a perfect American accent welcomes us and leads us to the showroom full of collared shirts TAL produces for JC Penney. We then take a tour around the hangar where a small group of people, some Ethiopian, some clearly expats, do the administrative work on fancy desks while the majority of employees – local women – operate the sewing machines. Although the hangar seems bright, modern and friendly, I can’t help but feel like I am in one of the Bangladeshi, Indian, Pakistani or Chinese sweatshops I have read and watched so much about. I can’t help but feel that I am standing in a place that represents what gave reason for me to start drastically changing my way of living a few years ago, when I decided to stop buying all this stuff that Western generation Ys grow up believing they need. I started with clothes, continued with meat and fish and went on to plastics and waste. I started seeing products as the results of tremendously complex and internationalized manufacturing processes, often directly linked to unethical labor conditions and environmental degradation, which I, whose primary paradigm in life is to contribute to making this world a tiny bit better, can’t consume anymore. But back to Hawassa. The perfect American accent now tells us about the $40 USD monthly salaries they pay to their seamstresses and how for them this is really an improvement of their living conditions. This employee tells us, of course, first, they have to be taught discipline “which they lack here” but after that, they can benefit from the shiny interior of their new workplace, a salary that’ll be sufficient for a room and food and roads that one could eat from. The low wages and disrespect for the workers compound in my mind. After the 15-minute visit, we leave TAL and the industrial park feeling uneasy. I am sure that there won’t be any more jokes about the industrial park. From now on, all of us, even our African politics professor with little interest in business, think about the sewing machines and the women operating them on a salary the amount of five hours minimum wage in the United Kingdom. I would have liked to give this story a more positive ending, one that puts emphasis on the impact the newly created jobs in Hawassa have brought to the women working in the industrial park, or one about children of illiterate parents who now go to school, or even one about the positive developmental implications this industrial park can have on lifting Ethiopia out of poverty. But so many manufacturing sectors before have been the hopes of nations to reach higher income status, India, Pakistan, Bangladesh, the Philippines, Vietnam, Cambodia, and the list goes on and on. Under the perception that jobs, no matter how badly paid, will bring development in the long run – called the trickling down effect, governments of poor nations have welcomed the foreign companies, often very labor-intensive ones, such as the garment industry. And it has since moved from country to country, seeking the longest working hours, the cheapest wages, the freest interpretations of decent labor conditions. Wages paid in Ethiopia are almost 50% lower than the hitherto lowest paid wages in the garment industry – 70USD per month in Bangladesh. It follows the old pattern – cheaper, longer, freer. We will see what it will take to disrupt this endless cycle – I, for my part, will continue discovering alternative consuming routes in the West, and how more people can follow those in the future. So that maybe one day workers in Ethiopia, or anywhere else in the developing world, will get paid a decent salary and work under decent labor conditions, just like we in the West.